A former police officer takes a shot at regaining some lost skills. 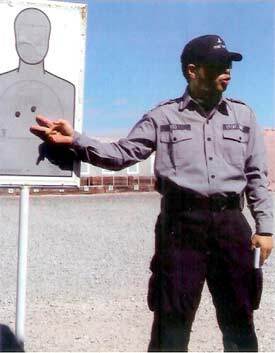 s I turned off Tecopa Road onto Front Sight Drive, the Front Sight Firearms Training Institute loomed large in the clear desert air. I pulled into the parking area where new students report for classes and noticed a line already forming at the sign-in table. It was 6:30 a.m., and more people were moving in behind me. I scanned the crowd but did not see anyone else in a wheelchair. Would I be the only one? How would the staff react to a student on wheels instead of two legs? Would the others think I had taken a wrong turn on my way to a rehab hospital? Oh well, I thought, as I lowered the ramp on my van, too late to turn back now. The Front Sight Firearms Training Institute, located on 550 acres of high-desert terrain near Pahrump, Nev., offers courses in the use of handguns. shotguns, and rifles, including fully automatic weapons. I had not been around so many people carrying guns in more than 16 years. At that time I was a vice cop with the Los Angeles Police Department I had worked for the LAPD for more than eight years and had previously served with another police department and a federal agency. I loved the shooting sports and had been using guns since age 12. I was born in 1949 and raised on a small farm in central Kentucky and took to shooting and hunting at an early age. Organized team sports were not a valid option for farm kids in the 1960s, so when I wasn't in school or doing chores I was usually out hunting. Not a squirrel or rabbit was safe when I took to the woods and fields with my .22 rifle or shotgun. My dad taught me how to shoot and how to use guns safely starting at age 10. When I turned 12, I was allowed to hunt on my own. This early introduction to the use of firearms would serve me well later in life. After high school I served 3 1/2 years in the U.S. Army, including a tour in Vietnam with the only Special Forces unit remaining in the country in 1971-72. During this time my knowledge of firearms and my shooting skills improved significantly. I also came to appreciate the destructive power of guns used against people. I enjoyed military life but had always wanted to work in law enforcement. I liked the idea of putting bad people in jail so they can't prey on their fellow citizens. Following military service I began my law-enforcement career with the U.S. Border Patrol in Calexico, Calif. This agency offered great firearms training and a chance to work in the wide-open spaces on the Mexican border. However, I was more interested in criminal law enforcement and later took a position as a patrol officer with the Las Vegas Metropolitan Police Department. After two years in Las Vegas, I accepted an offer with the LAPD. Mike Greer's two-day Defensive Handgun course helped him reacquire his ability to shoot well. The school treated him with courtesy and professionalism and was able to accommodate students with disabilities. By this time I was quite proficient with all manner of firearms and had become a pretty good marksman. I didn't have the natural talent to compete on the LAPD shooting team, but I was good enough to be on my division team. I did well except for the first LAPD-LASD shooting match. While taking warmup shots on the range, the rear sight on my revolver fell off because I had loosened the retaining screw too much during a prior sighting-in session. There was no time to realign the sights, so I had to resort to Kentucky windage and Tennessee elevation (guessing) when it was my turn to shoot. My team still took second place. Even so, my teammates never let me forget we should have received the first-place trophy. On January 4, 1988, my career came to an end when a single moment of carelessness resulted in an accidental shooting. That accident, involving my duty weapon, left me a T4 paraplegic. After several months of rehabilitation, I returned to work. However, ongoing medical problems made it impossible to continue; in 1989, I retired on a medical pension. I did very little shooting over the next several years. As a retired officer 1 was authorized to carry a concealed weapon and continued to do so. Occasional practice sessions made it clear my shooting skills had diminished severely over the years. I didn't give it much thought until one day when I went to my favorite food market in Irvine, Calif. A few minutes before I arrived, a mentally deranged man had entered the store with a sword. He killed one customer and severely injured another before a responding police officer shot and killed him. I realized that had I arrived a few minutes earlier, it might have been me who was forced to use a firearm against a violent assault. I knew then it was time to regain those old skills. In 2004, I received and accepted a membership offer from the Front Sight Firearms Training Institute near Las Vegas, Nev. The institute was founded by Dr. Ignatius Piazza of Aptos, Calif. Dr. Piazza had completed numerous firearms training courses and decided to open his own school so others could benefit from his training and experience. Front Sight is located on 550 acres of high-desert terrain near Pahrump, Nov., about 50 miles northwest of Las Vegas. 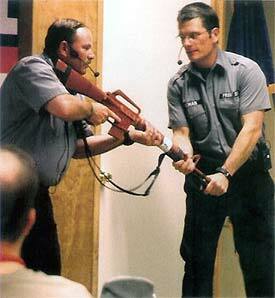 The school offers courses in the use of handguns, shotguns, and rifles, including fully automatic weapons. The classes range from basic self-defense with a handgun to the most advanced tactical firearms training for military and law-enforcement professionals. Classes are also available in martial arts and defensive driving for adults and rope climbing and youth safety for children. The facility trains thousands of students each year and has earned a highly respected reputation in the firearms-training industry. I decided to attend a two-day Defensive Handgun course in March 2005 as a way to begin reacquiring my ability to shoot well. I was a little apprehensive, even though Dr. Piazza had assured me in an e-mail that his school could accommodate students with disabilities. As it turned out, there was no need to worry. From the time I signed in, the Front Sight staff treated me with total courtesy and professionalism .They asked if I needed any special equipment or assistance in moving around the area. I advised them of my physical limitations and was assured the range instruction could be adjusted to fit my needs. After sign-in and a welcoming orientation in the main classroom, we proceeded to our assigned ranges to begin training. There were approximately 40 students in my class, and about one third were police officers. The civilians were a mix of men and women from different backgrounds. Three husband-and-wife teams were in the group. 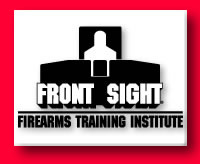 ABOVE: Instructing thousands of students each year, Front Sight Firearms Training Institute has earned a highly respected reputation in the firearms-training industry. LEFT: The classes at Front Sight range from basic self-defense with a handgun to the most advanced tactical firearms training for military and law-enforcement professionals. The rangemaster and instructors were an impressive group of highly skilled professionals. Most had backgrounds in the military or law enforcement, and all had completed numerous courses in firearms training and have passed a rigorous testing process to qualify as Front Sight instructors. The rangemaster began a methodical, step-by-step process in the basic use of a handgun for self-defense. The instruction included proper grip and stance with the weapon, drawing from the holster, sight alignment and trigger control, checking for a loaded chamber, proper reloading techniques, and clearing malfunctions. Firing began with a single shot into the center of a human-size target. If a single shot does not stop your assailant, you are taught to fire two fast shots (double taps) into the same area. In the event two bullets do not stop a violent assault, you then fire one round into the center of the head. This is a more difficult shot to make and requires substantial practice to do quickly and accurately. The shooting practice was at ranges of 3-15 meters, and the techniques were drilled over and over. Safely was paramount. Guns were checked and rechecked before and after each session. By the end of the day, my performance with the .40 caliber Glock I carry had improved considerably. The students in my class displayed varying levels of competency in the use of their weapons. The instructors were patient and gave personal attention to anyone who needed extra help. There was no drill-sergeant mentality here. Their friendly, helpful approach instilled a sense of confidence and ability in each student. This constructive learning environment made all of us better shooters by the end of the class. Along with the shooting techniques, we received classroom lectures on mental awareness (how not to become a victim), moral and ethical decisions of using deadly force, and potential civil and criminal liabilities. The two-day course was an effective combination of relevant information and practical, hands-on training. Instruction included proper grip and stance with the weapon, drawing from the holster, sight alignment and trigger control, checking for a loaded chamber, proper reloading techniques, and clearing malfunctions. My experience at Front Sight was more positive than I anticipated. The entire staff was extremely courteous and went out of their way to assist me at every turn. I was allowed to park my van in areas off limits to students but closer to the range and classroom for easier access. My fellow students were also helpful and treated me as an equal. As it turned out, I was not the only "gimp" on the range. A gentleman in his 60s had a lung ailment and carried an oxygen tank on his back. He was afforded the same courtesies and seemed to do quite well. I noticed a student in another class who walked with the aid of a cane. The hardest thing for me was pushing my chair on the range between the targets and staging area—about 60 meters across a gravel surface. By the end of the day, I was fired and had difficulty holding my gun steady. A fellow student noticed I was slowing down and offered to push me. That macho male pride reared its ugly head, however, and I declined. 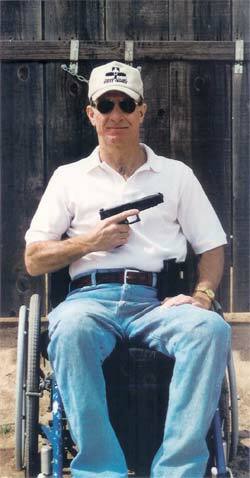 I highly recommend the Front Sight Institute to anyone with a disability who is looking for the best possible instruction in self-defense. My training refreshed old skills gone dormant and inspired me to continue relearning what once came naturally. 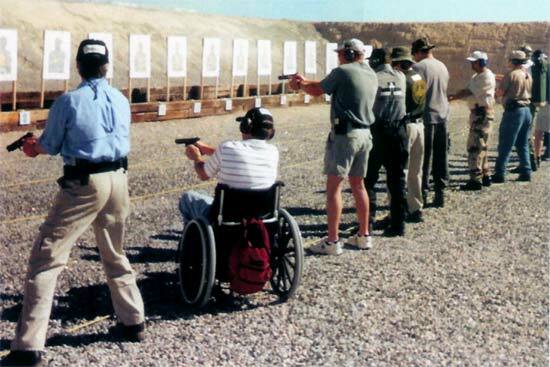 You should have sufficient upper-body strength to handle a weapon and, if using a wheelchair, to navigate in an open, outdoor area. You will enjoy a pleasant, satisfying experience at the world's premier school for personal self-defense. Retired police office Mike Greer, 55, lives in Cypress, Calif. and enjoys pistol shooting, sporting clays, hunting, mono-skiing, snowmobiling, travel, and good movies.